On March 16, 1992, workers at the Sequoyah Unit 2 reactor near Chattanooga, Tennessee inspected its ice condenser doors. 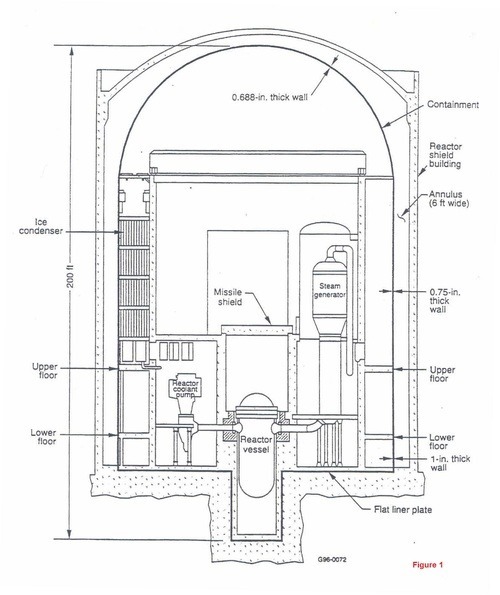 The ice condenser is a large vault-like structure that encircles the base of the reactor containment building as shown in Figure 1. The ice condenser is sub-divided into 24 bays. 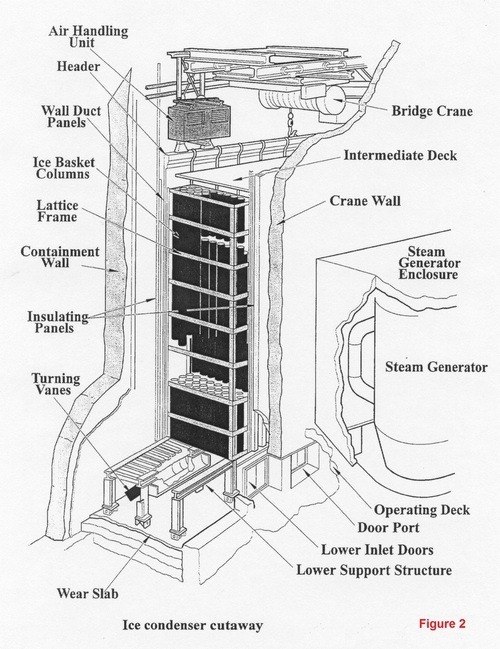 Each bay has two hinged inlet doors in the bottom of the wall between the ice condenser and the reactor containment building, as shown in Figure 2. Each bay contains 81 large (45-foot tall) baskets filled with ice. Overall, nearly two million pounds of ice fill the ice condenser. If a pipe carrying high pressure steam inside the reactor containment building breaks, this high-energy steam increases the pressure within the building. The ice bays are part of a safety system intended to react to such a problem. The pressure in the building pushes open the inlet doors allowing the the steam to flow into the ice condenser, where the ice cools it. As the steam loses its energy it condenses into water. Thus the ice absorbs the energy that was originally released into the containment building during the accident. Without this ice, the containment building would have to be much larger or its walls much thicker in order to handle this energy. Said another way, since the reactor is built assuming this energy release system will work, the containment building is not designed to handle this energy without the ice condensers. So it was alarming when the workers at Sequoyah found that 27 of the 48 ice condenser doors would not open. They entered the ice condenser bays and found that the floor had warped, blocking the movement of the doors. Nearby reactor Unit 1, which was at full power at the time, was inspected two days later, on March 18, 1992. Workers found a similar problem: 11 of its 48 ice condenser doors would not open. Unit 1 was promptly shut down. The ice condenser floor consists of 15-inches of concrete, a one-inch layer of grout, a 1/4-inch thick metal plate that contains glycol piping, and a 4-inch thick concrete wear slab on the top. Repeated freeze/thaw cycles caused water, which had seeped down under the wear slab, to freeze and buckle the concrete surface layer. The buckled floor prevented many of the ice condenser doors from opening properly. The doors must open during an accident for the ice condenser to limit the pressure increase inside the containment building. If several of the doors fail to open, the containment building pressure could rise above the design pressure. As a result, the containment could fail, allowing the uncontrolled release of large amounts of radioactivity to the atmosphere. These deficiencies were found during routine testing. That is why testing is done. But testing must be thorough enough and frequent enough to find problems before they get as bad as in this case. More than half of the ice condenser inlet doors were blocked on Unit 2 while nearly a quarter were blocked on Unit 1. The cause – freezing and thawing cycles – does not suggest a rapid degradation of the floor. Instead, this problem most likely evolved over time, from one bay on one unit to many bays on both units. To be useful, testing must find safety problems before they get as bad as in this case.